For my second official 'coffee break blog' I thought I would venture indoors for a change, primarily because the good Scottish summer has not been condusive to lurking around graveyards with camera in hand, well not yet anyway, and also because my waterproofs have somehow gone walkabout! 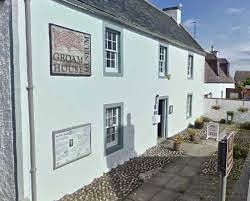 But it was worth making the effort and, as such, I would like to introduce you all to the Groam House Museum, a remarkable little museum to be found in the village of Rosemarkie on the Black Isle, just north of Inverness. 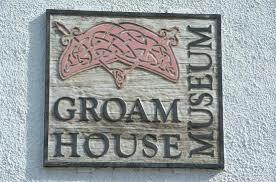 Groam House Museum is renowned for its collection of both Pictish stones, many of which were discovered locally, and the George Bain collection. For those of you unfamiliar with George Bain (1881-1968) he was an exceptional artist, an art-teacher and widely regarded as being instrumental in encouraging the revival of Celtic art. You will not fail to notice a selection of his esquisite drawings on the wall as you enter the museum, which attempt to analyse the Celtic patterns that appear on numerous Pictish stones and elsewhere, such as the Book of Kells and the Book of Durrow. But we shall return to Mr Bain in due course. 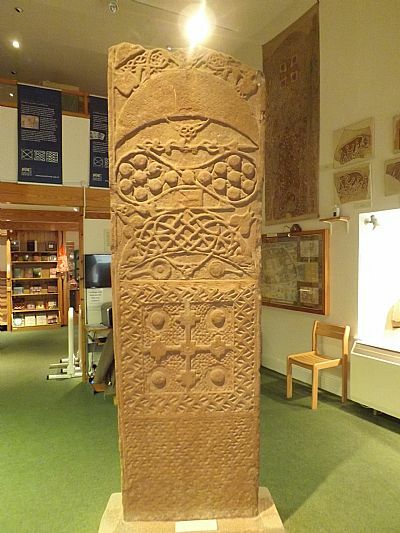 So without further ado I would like to introduce you all to a rather breath-taking example of Pictish workmanship to have survived to date, namely the Rosemarkie Cross, which takes centre stage in the museum. Dating to around the late eighth century, its original location is sadly unknown, it has been situated both in and outside of the adjacent local church in years gone by, but was given to the Groam House in 1980 for safe keeping. Currently reaching a height of 2.9m x 0.75m x 0.18m, the cross has sadly been broken into three pieces, one which is now missing. The current slab consists of two of the fragments, joined together in the middle, with the lower slab embedded in the concrete base. The stone is carved on all four sides. The reverse panel, shown above, illustrates some skilled Pictish craftsmanship. The top panel depicts common Pictish symbols, including two crescents with V-shaped rods; the remains of a third crescent at the top; a double dics and Z-shaped rod; a double-sided comb; and finally a mirror. The two complete crescents are filled with a key-pattern and interlace, which have helped archaeologists date this particular stone to the eighth century AD. 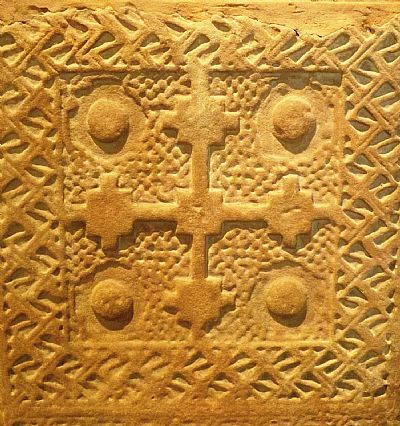 A close-up of the middle panel, see below, depicts an equal-armed cross, with a series of stepped terminals, within a deep border of key-pattern. The background of the cross and the bosses in the quadrants are filled with a fine interlace pattern, which continues throughout the middle panel. 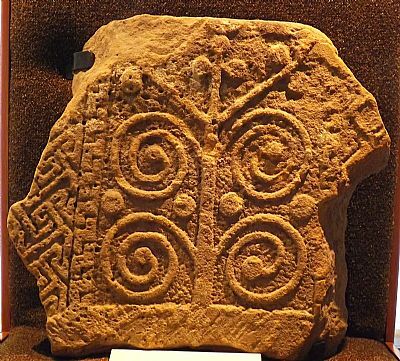 The bottom panel is also filled with a key pattern and is typical of late Pictish sculpture. On the wall opposite the Rosemarkie Cross can be found a number of stones that were discovered locally, the example below was found in the adjacent churchyard and was presented to the Society of Antiquaries of Scotland in 1885. The stone currently on display is not the original mind you but a cast, the original is now in the care of the Museum of Scotland in Edinburgh. Measuring 250mm x 270mm x 70mm, and decorated on only one side, the relief appears to depict a bearded man surrounded by five wolf-like beasts. Some have argued that this particular scene may represent the biblical Daniel in the Lions Den or depict the fate of the wicked, being dragged into hell by loathesome beasts. 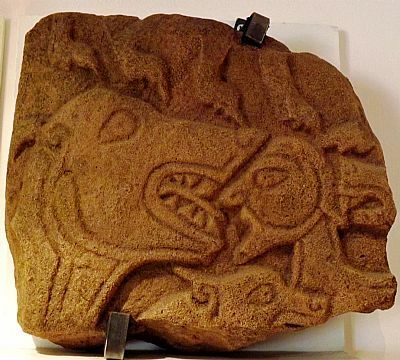 But Pictish experts think it is more likely to represent an unknown native story of some kind. In the right-hand corner of the museum is a larger carved relief with an undeniable more Christian feel to it. Discovered in Rosemarkie Churchyard in the late nineteenth century, and measuring 488mm x 530mm x 113mm, the decoration consists of a stylised plant with two pairs of tightly coiled shoots ending in lobes, growing from a central stem. The stem itself terminates in a triple arrangement of stylised fruits. The plant is framed on the two vertical sides with an edging of a simple key-pattern, the bottom border is gently curved as to give an impression of a shallow mound. The lower moulding is plain and there are traces of what may be a similar moulding just above the plant. This particular fruit-like design is often referred to as a 'vine-scroll' pattern and reflects the passage in the Gospel of St. John, Chapter 15, where Christ compares Himself to a vine, and his disciples to that of its fruit. The grapes of the vine also relate to the wine associated with the Sacrament of the Eucharist into the Blood of the body of Christ. The final example I would like to share with you all is one of my favourites within in the museum, which may be somewhat surprising considering its lack of decoration. However, I have a penchance for so-called incised cross gravemarkers in all their varied glory and for me perrsonally this one is no exception. 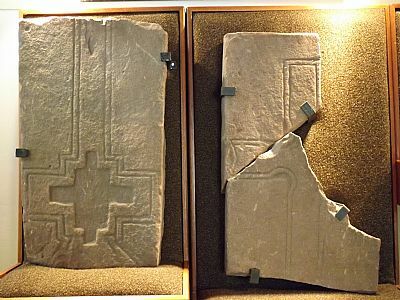 This particular example was once again uncovered in Rosemarkie Churchyard in the late nineteenth century and was originally displayed as three individual fragments. It soon became apparent, however, that it was in fact one singular slab, probably a recumbent funerary slab or a lid for a stone coffin. When joined together this impressive stone measures an impressive 1461mm x 448mm x 93mm and consists of an incised double-outlined shafted cross, with curved hollows at each arm, terminating in a complex cruciform stepped base. The closest parallel for this particular slab is a full length cross with a stepped base found on St Cuthbert's coffin in Durham Cathedral. If you take a closer look you can still see the original tool marks at the base of the stone. The Museum consists of two floors and the upstairs exhibition area focuses on 'Crafting the Celtic Art Revival' and displays various examples of the aforementioned George Bain, who began his study of Celtic art with the careful and meiticulous drawings of Pictish stones and early medieval insular manuscripts. On the walls can be viewed various examples of his work, such as his contributions to the Royal Scottish Academy in 1929, as well as more personal items, such as a hand-painted dinner service set, originally a wedding present for his daugther, Claire. So there you have it folks. A brief look at a rather splendid provincial musuem, well worth a visit if you ever happen to be travelling up in these parts. Other delights to be found in its walls include a replica Pictish harp, which can be played, a 'rubbing area' with a collection of Pictish symbols for both adults and children alike, a comprehensive collection of photographs for research purposes and a well-stocked museum shop. Admission to the Groam House Museum if FREE, always a bonus, and opening hours are Monday-Friday: 11am - 4.30pm, Saturday and Sunday: 2pm - 4pm (currently closed on Sunday due to staff shortages) Further details can be found on their website at http://www.groamhouse.org.uk where you will also find a number of free download books for those of you who are interested to discover more about the Picts. If you have any questions after reading this brief introduction, please feel free to get in touch. Always happy to answer any queries. Next blog post, a review of the newly released book 'Bodysnatchers' by Suzie Lennox.